First of all, my current hardware scheme, the "RC2014/LL MicroLlama" as I call it, is and has been fully functional in its current state, and is emulated well in my emulator. A ton of chips and a well packed board! The short description of this is that it has some I2C I/O Expanders that sit on the entire bus (Data, Address, Control) as well as replaces the system's 7.37 Mhz clock board. This can be used to snoop on the system, read/write IO, read/write RAM, etc... taken one level above that, you can use SMB's python scripts to upload data right into RAM, thus eliminating the need for a ROM module. It took me about 15 minutes to figure out the orientation of that crystal. Also, I'm not sure the jumper configuration is correct yet. That's where my personal problem with it comes in. As it stands, his project uses a RasPi to communicate with the board over I2C. This is fine, however it does not fit within my workflow. I do not really have a RasPi to use for dev work, so my solution is to take a tiny Arduino Leonardo clone ("Micro-SS" like this one), with a cable connecting its I2C lines to the Bus Supervisor Board. Then, I'll make a thin Serial-I2C bit of software and making some desktop tools, perhaps in python to fit with the original from SMB. My "proof of concept" for USB-I2C communications. Here it's connected to an RGB color sensor. The end result is that in my Z80 project makefiles, i can add a target for the generated .HEX files to be downloaded directly to the physical RC2014. I've made a cable for my Micro-SS and have built my Bus Supervisor Board. As you can see in the photo, this is it set up on a powered RC2014 backplane with only the standard IO module, and a few LEDs on a few data lines, so that I can test out everything before putting the CPU and RAM on there, potentially damaging them. 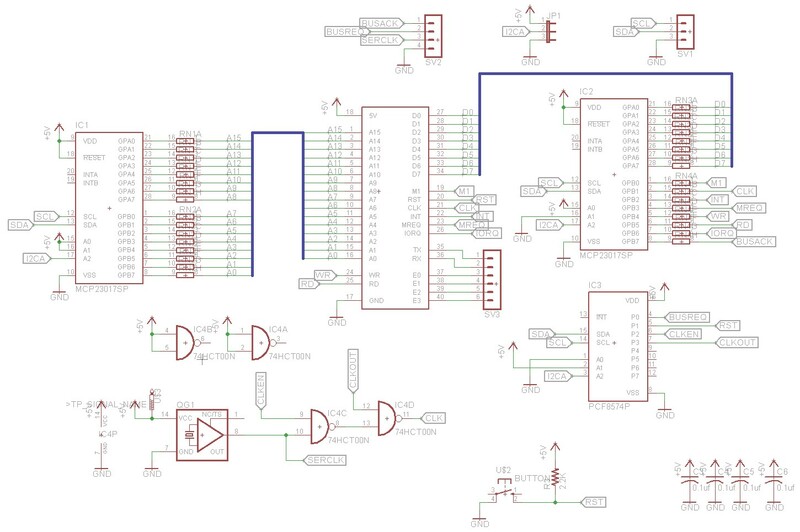 Obviously, it would also be possible to include a couple of ROM programs directly into the MicroSS, and possibly store a small one in the ATmega 32u4's EEprom as well. Some buttons on the MicroSS could be used for injeting these pre-stored programs. i could even see a program that generates a menu that the arduino can basically farm out to the Z80 to get user responses/menu options, etc. Additionally, I can make a RC2014 bus - to - pac-man bus adapter, and actually deploy code-in-development directly to the machine from my desktop from the makefile/build scripts. ... This is a dev tool I've wanted for about 20 years now! I also received this past month the boards for these two official RC2014 boards: the 64k RAM and Pageable ROM. As you can see in the pic, i still need to order quite a bit to make these work. 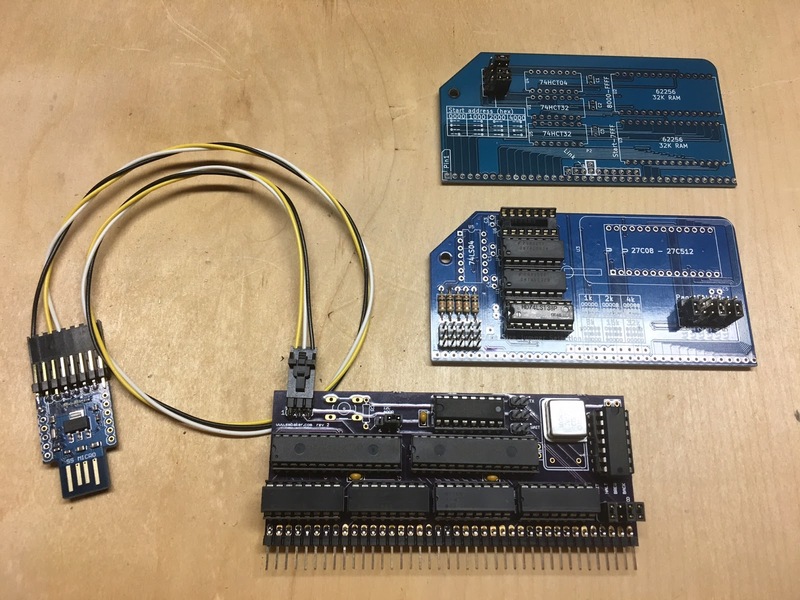 Now that I have the Bus Supervisor board, the Pageable ROM is less interesting to my needs, although I may still adapt my RC2014/LL design to use these pieces instead. You can see pics of these in the top of this blog post. The 64k RAM will definitely work well with the Bus Supervisor board, however the Pageable ROM board has definitely taken a bit of a slip down my plate... Until I can get the parts in for the RAM (sockets, etc) I can use my existing unmodified 32k RAM board for the upper segment of memory ($8000-$FFFF) and my slightly modified second 32k RAM board for the lower segment of memory, I just have to manually enable it for read/write.